During the past week I’ve seen lots of #2018makenine sewing plans on Instagram in the lethargic hours between bouts of sinusitis and gastric flu. 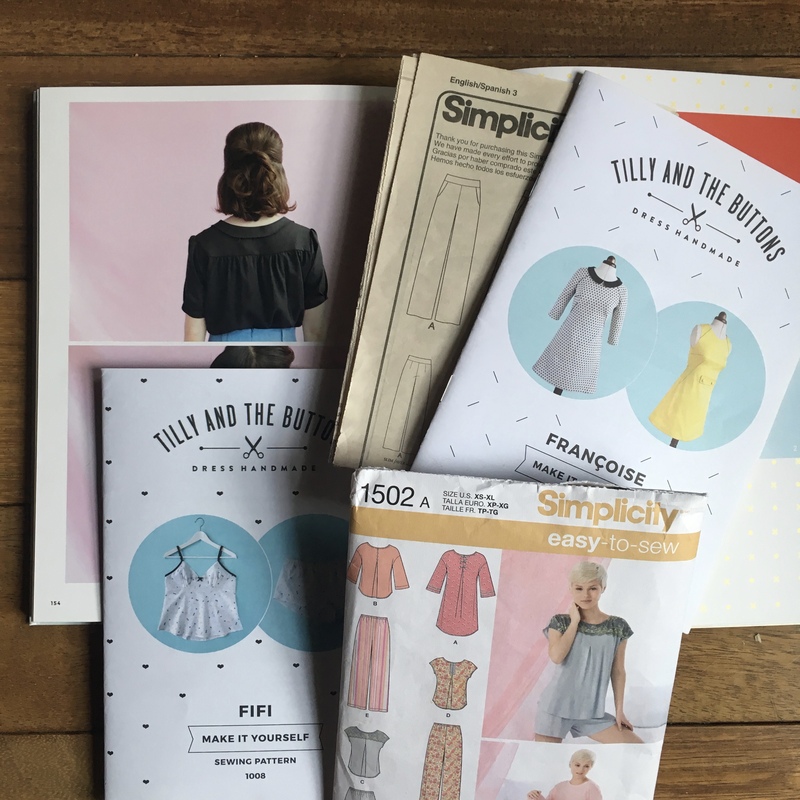 Although I felt too washed out to pull together my own collage of patterns, I was certainly mulling over my sewing plans. And in hindsight I don’t think the nine-grid Instagram collage would have worked. My “plans” involve too many variables. I regularly ask myself “Why do I choose to make rather than buy” as this directs my making. There is nothing wrong with making for the sheer joy of it, and there is certainly some of that in my knitting, but with dressmaking I am motivated by more practical factors. quality and provenance (ethical and/or environmental) of materials. I don’t get to tick all these boxes for all my garments but I am systematically meeting more of my criteria for more types of garments. 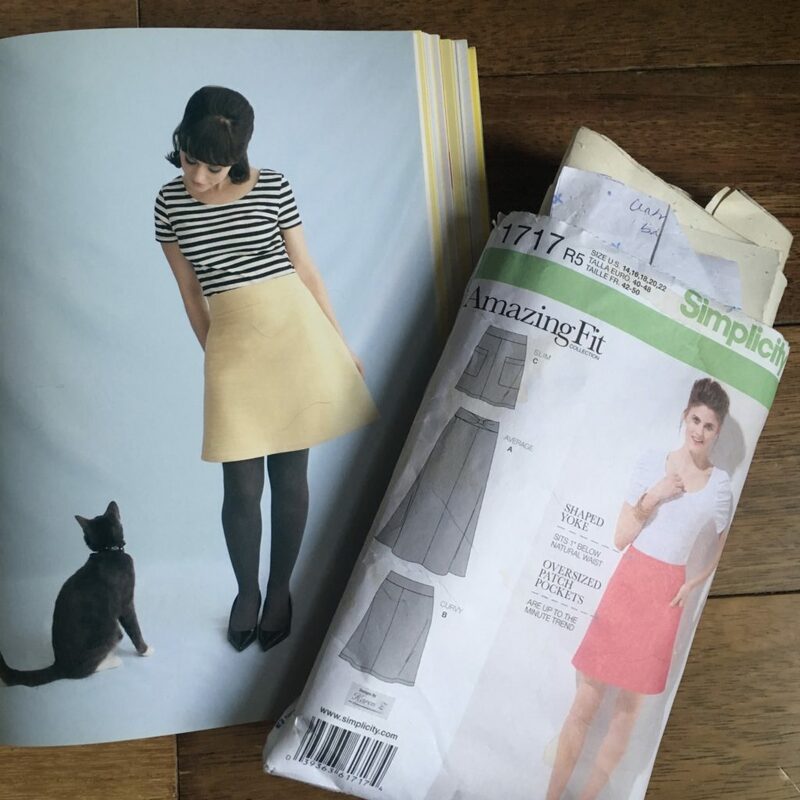 I have two tried and tested patterns, one of which is based on the Delphine skirt in the Love at First Stitch book by Tilly Walnes and the other on the alas discontinued Simplicity 1717 skirt. As I have made both of these several times and now know which modifications I need to make them work for me, I feel confident enough to invest in some British wool to make a smart winter skirt. 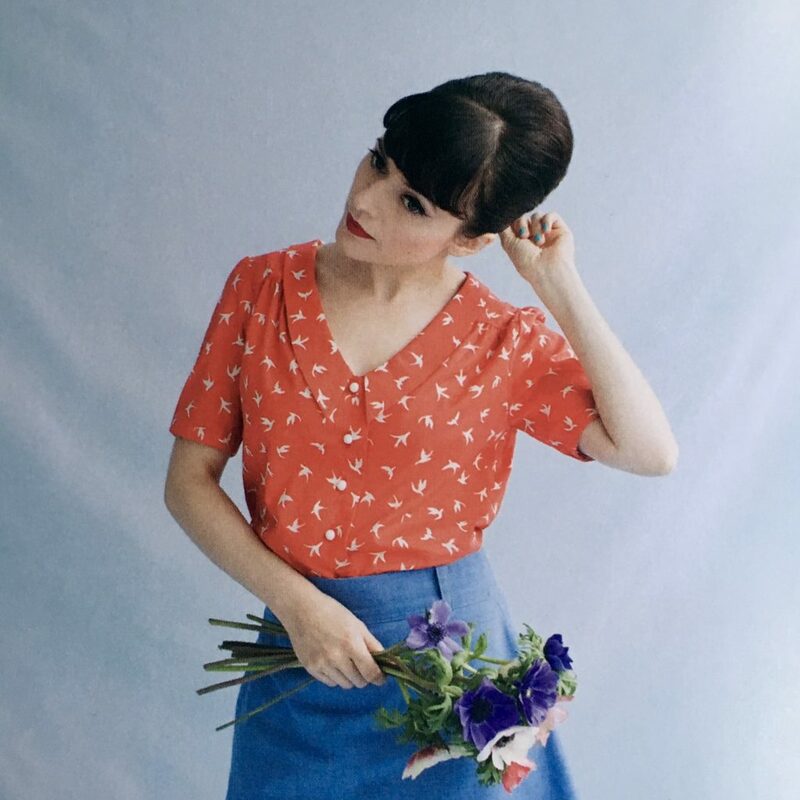 I have made two toiles of the Mimi blouse from the above book and am ready to move on to a wearable toile to see if all the tweaks I have made to the pattern will actually produced a garment that works for me. If so, it will form the basis for more tops in my wardrobe. Another outcome might be realising that, notwithstanding a hopefully wearable top, the Mimi blouse just isn’t the best pattern for my body shape/style. (I have doubts about the use of gathers for bust shaping!) Although that would be disappointing, I will still have gained new skills and a better idea of what to look for in other blouse/shirt patterns as well as a better grasp of what modifications I will typically need to make to any other patterns for woven tops. In episode 8 of my podcast I mentioned I am on a quest for a well-fitting full slip made from 100% natural materials (so no nylon or figure hugging Lycra). This project will mean really mastering fit. As I don’t want to waste too much fabric in the process, I will first focus on finding a camisole pattern that works for me and then lengthen it. I have already made a toile of the Cinnamon camisole by Colette. This pattern really stretched my skills but the bust cups are based on gathers, which just added bulk so not ideal for a figure skimming slip. I am now working on a toile of the camisole from the Fifi pyjamas by Tilly and the Buttons. Like the Cinnamon camisole, this pattern is cut on the bias, which will help with drape, and the cups are shaped using pleats, which I hope will make for a less bulky line. I have never been particularly precious about nightwear. My key objective is warmth, which means layers. My nightwear drawer currently consists of an old tee shirt, old yoga leggings, a couple of Mr M’s faded casual shirts and a couple of cardigans that have seen better days. Oh, and socks! Having spent the best part of a week in bed or snoozing on the sofa with bouts of fever, I’ve realised that a few more items of nightwear would not be an indulgence, particularly for times when I can’t turn the laundry fast enough. Of course, I could just commandeer more of Mr M’s shirts but the cotton from his white city shirts is too precious as material for dyeing or future tops. And Mr M’s cosy casual shirts, made from soft cotton twill, just don’t wear out fast enough! As nightwear involves more ease, I don’t need to be as precious about fit so I will be making these out of cotton recycled from charity shop finds or failing that, new organic cotton. 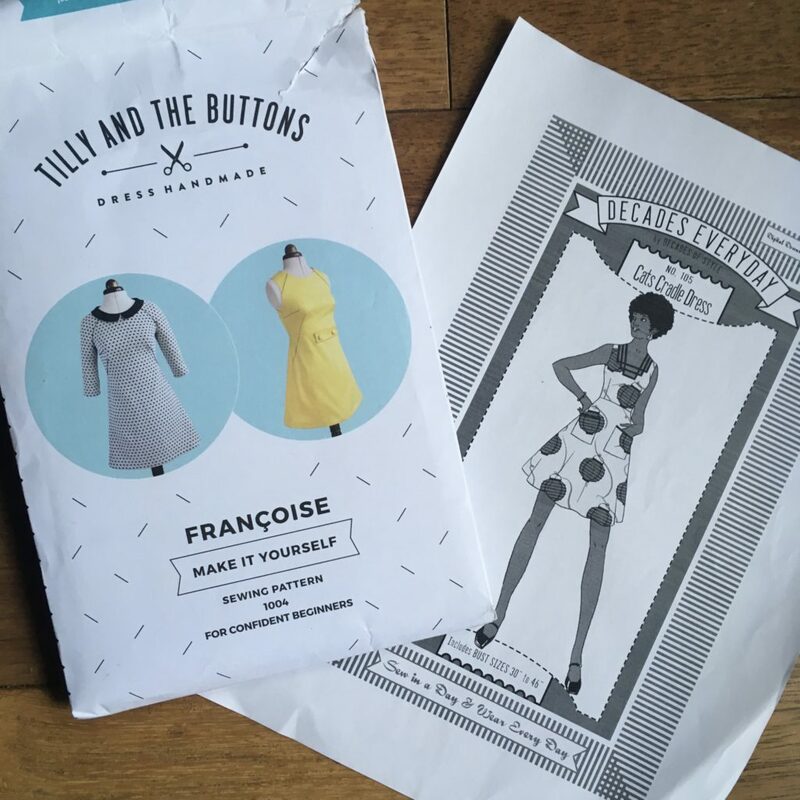 The Francoise dress by Tilly and the Buttons – yes, this pattern company generally seems to work for my body – is a shapely shift dress with a raglan yoke/sleeve construction. My other go-to dress is based on the Cat’s Cradle Dress by Decades of Style. I replace the intricate neckline with a V-neck but like the design as its shaping works well for my proportions and only requires relatively easy modifications. I’ve already mastered the tweaks to the front bodice of both these dresses. The next step is a swayback adjustment, a fitting modification I only recently discovered. I’ve never been a massive fan of trousers but I always put it down to ready-to-wear trousers being based on sizing that is alien to my body. 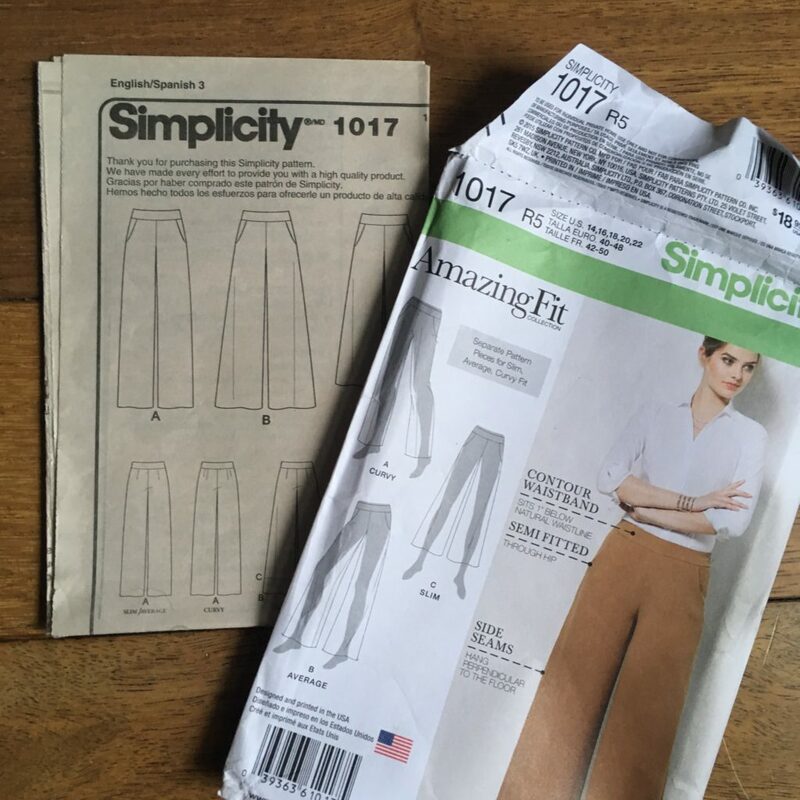 In my effort to reduce my dependence on tights (and the synthetic fibres they contain), I have tried to sew trousers using the Simplicity 1017 pattern (View A) from its Amazing Fit range. I picked this design based on the features of the only commercial trousers I have enjoyed wearing, i.e. a side zip, yoked waist and wide leg. I made the first toile out of a bed sheet and a wearable toile out of a cotton twill with the merest hint of Lycra. At the fitting stage they fitted perfectly but once I started to wear them, the fabric relaxed and they felt annoyingly baggy. It is hard to say how much of this ease was down to the elastic content and the twill weave respectively. This year I plan to pinch out the excess fabric in my pair and overlay the pattern pieces to work out which size I should cut next time. Oh, and I’ll dispense with the Lycra. In the last two years I’ve learnt that most fabrics give a little with wearing so adding Lycra is unnecessary if I get the fit right. And if the next pair doesn’t fit comfortably, I will investigate line drawings and reviews of other patterns as I do think trousers are missing from my wardrobe. I wear my knitwear for the best part of the year. Even on summer days, I wrap myself in a large shawl. This is partly because I am often still a little chilly, but also to protect my pale skin from the sun. One of the gaps in my wardrobe is therefore a summer cardigan! I could of course knit a linen cardigan but as knitting with linen is hard on my hands, I think the more sensible option is to make one out of organic cotton jersey. As I sew to have some control over the fabrics I use, and especially to minimise the amount of synthetics, I am trying to pin down a pattern that will work with a Lycra-free jersey. 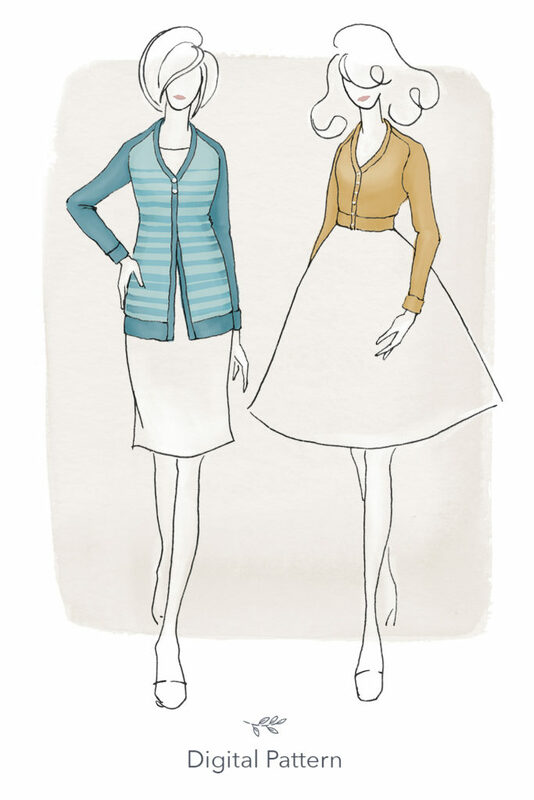 Most pattern candidates, like the Blackwood cardigan by Helen’s Closet or the Juniper cardigan by Jennifer Lauren Vintage, require fabric with a fair amount of stretch and recovery (which usually means Lycra) so I will have to get creative with either the fabric or sizing. People chuckle at the thought of anyone making their own knickers, and whilst I learnt how to make them some years ago, it was never a priority for me either. However, I have noticed that in the last five years the quality of undies has plummeted. It doesn’t matter where I shop, not only is the cotton thinner, the Lycra content increasing and the elastic more half hearted, retailers also seem to be skimping on how much fabric they use. Now may therefore be the time to start making some of my own smalls, particularly as my dressmaking efforts mean I am building up a supply of leftovers. And my quest for 100% cotton knickers may actually give me a kick up the proverbial to learn how to sew a rolled hem. As the above suggests, I am quite a practically minded person. 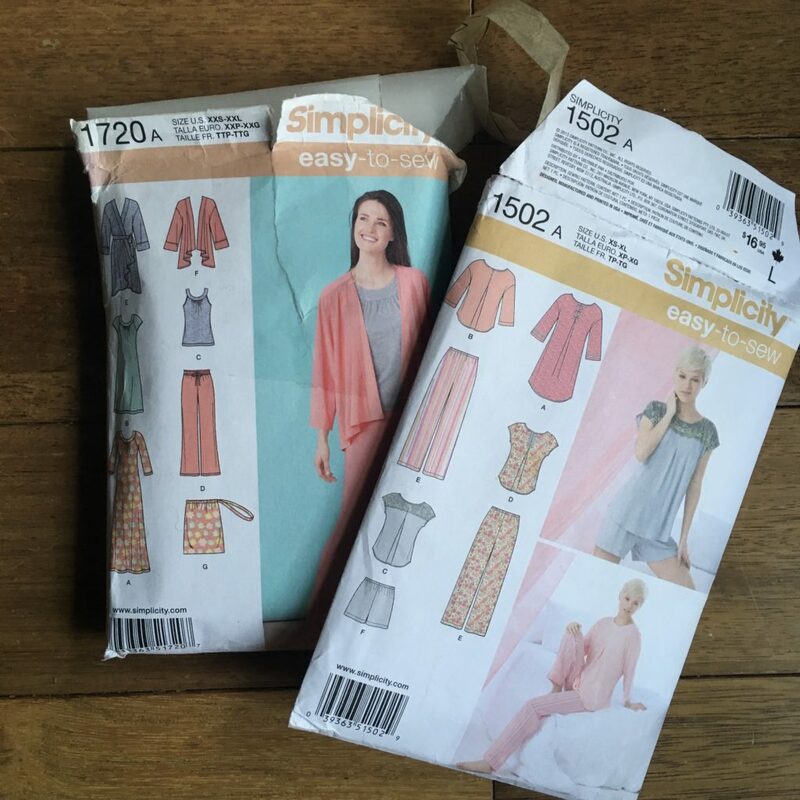 The focus is on filling gaps, perfecting patterns I already own and sourcing fabrics with care. To counter the disillusionment that will no doubt set in when toiles don’t fit on the first, second… attempt, and to keep my sewing mood fresh, I also need to factor in some playing. That may be trying a new dress pattern, or once I have mastered a pattern going really off-piste with a fabric, or making something “dressy” for my “social life”. Knowing my disposition, it may also be taking on a project that really stretches my sewing skills. Maybe making a shirt for Mr M, or learning how to work with oilskin by making a bag or back pack, or if the knickers work out, trying some bra making again. My experience with the blouse, camisole and trousers patterns – and I should stress there was nothing wrong with any of these patterns – illustrates why I struggle to commit to nine patterns for 2018. I will almost certainly sew nine items, probably more. However, as a still relatively new sewer, I have realised that I am recycling not just new skills into each sewing project but also a better understanding of how garments are constructed, how fabrics behave, what my body measurements and importantly proportions are, what styles I find easier to tweak to fit my body, what styles I actually like wearing… Add to this my fabric constraints and I need to remain flexible. I may realise that certain garments just aren’t feasible without the drape or stretch of hybrid manmade or synthetic fabrics and that I have to rethink which patterns or even styles I sew. And then there is always the chance that something in my wardrobe will perish sooner than anticipated and I need to pick a different pattern to fill the gap. Sounds like a bunch of worthy goals for your sewing! I totally hear you on the undies – I’ve just pitched out my third worn-out pair in a month and can’t find anything worth purchasing in the shops. Time to make some! Sorry to hear you are also having troubles finding smalls that last. I hate wasting the money and resources and also loathe having to face shops to restock. I know what you mean. I hate rippled saggy effect you get when the elastane wears out at a different rate to the base material. The only garments where I really appreciate a little of Lycra are cotton leggings but even hear quality usually lets the garment down and before too long the legs are all saggy. Not an attractive look! I’ve had good luck with a smooth slip with shoulder princess lines, I’m sure it’s not still in print though, I bought it from Burda in the 1990s. But a princess cut (or darted princess if you really need a lot of shaping) might be smoother than gathers. I’m still wearing the underwear I made while pregnant with my son – and he’s taller than I am now. The quality issue is real. Interesting observation about D&D’s bust sizing. Thank you, Patricia. I hear you on the difficulty in avoiding synthetic fibres when wearing skirts. I’ve really gone off tights in recent years, and struggle to find even mostly natural fibre ones that fit me well. I often wear leggings under skirts and dresses but they are not my ideal either, and though they last longer than tights for me they still don’t manage many seasons intact. Having not worn trousers for many years I’ve been rediscovering them recently. Sadly my sewing skills aren’t good enough to make my own yet but I’ll follow your progress with interest. PS I’ve been reading about zero waste sewing and thought of you marking out dimensions of fabric and trying to fit your pattern pieces in the smallest possible area.